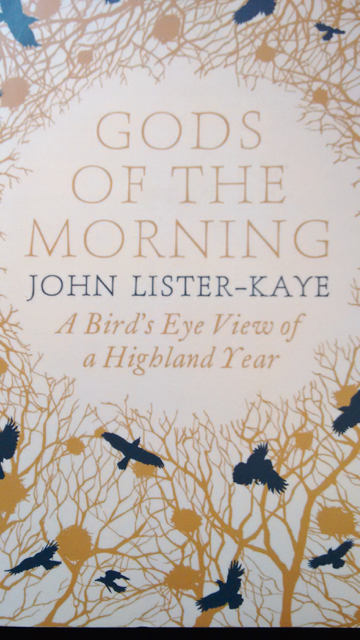 A Bird’s Eye View of a Highland Year, by John Lister-Kaye. Canon Gate, £14.99 hardback, £12.99 e-book. Any preconceptions I might have had that this would be the standard “Year in the life of” nature book were summarily dispelled on page 3 of the preface. John Lister-Kaye has run the study centre at Aigas in the Scottish Highlands since 1976, and in the time he’s followed natural life there he has seen disturbing, if sometimes subtle, changes. Take the moorland waders – curlew, lapwing, greenshank and redshank that used to nest on the moors and rough pasture 30 years ago. All gone. And the year 2012, when the swallows didn’t even nest. So, from early in the book we learn that that this is no charmed Shangri-La of a valley, immune to the wider degradation of the natural environment. Small but significant clues of a changing climate are clear to him, most of which otherwise go unnoticed, when he sets them against his accumulated observations. This candour already sets A Bird’s Eye View of a Highland Year apart. There have been many accounts of the unfolding year in the British countryside, but few told with the honesty of this one. It departs from the cosy, complacent script, telling how wonderful nature is, and how the resilient wild community always manages to persevere through the year and come back to the beginning again, in the appointed season, ready to start the survival course all over again. This upbeat view of nature has been a standard feature of wildlife programmes on TV for years, with their jaunty “all is well in the countryside” tone, and it’s hard not to be reassured by it. There are many natural glories all around us, and it’s right we should appreciate them through all that wonderful camera work. And I accept it’s harder for TV to report on a negative, on a bird or flower that just didn’t show last year. Yet it’s a deceit, and books like the this make it harder to maintain. It strikes me that anybody trying to chronicle the landscape and countryside about us, from personal observation over the recent years, will not have come to the same conclusions, with the caveat that only some things can be pinned on a changing climate. So I can’t necessarily blame the weather for the non-arrival of willow warblers (and last year for the first time in 25 years) the cuckoo to the Southern English countryside where I live. Hunters in Malta, perhaps? There’s more to this book of “encounters, observations and speculations”, however, than a bleak catalogue of a diminishing natural world. Lister-Kaye has a rich, evocative style of writing that reminds one of the late and still lamented Kenneth Allsopp, who chronicled Dorset with such elegance and insight. He includes many heartwarming descriptions of creatures big and small, holding their own in this multilayered biosphere, where nature is not held back by artificial stimulants and chemical checks. This diligent, and patient, observer of life in his glen records red squirrels “pruning fresh pine fronds”, and the “very sensible migration indoors of wood mice.” He lingers with keen insight on the finer details of willow warblers, gold crests and tree creeper. He feels privileged to regularly see golden eagles, peregrines and ospreys. Lister-Kaye set up the Aigas field centre in the Highlands, you where he lives and works, in 1976. Even when you take account of the new meteorological reality and its coinsequence, it is still a stupendous place to live. He reports some wonderful encounters with wildlife, in a place he knows “with a level of intimacy few can achieve”. He chronicles his environment over the course of the unfolding year, in this case from the start of one autumn, in September, through to the onset of the following autumn. Indeed deepest winter is a rare period of inactivity in his book,. Every week seems to have its natural history point of interest, even in the dull days of November. Chapters open with some wonderfully apt quotations, some of them from classical times, which shows how deep-seated is our desire to mark the seasons. But most frequently it is Shakespeare who reads our turning year as well as anyone. He reports unexpected wonders, such as the sight of the massed gossamer threads of millions of tiny spiders – “a spectacle of overwhelming natural abundance”. And yet that worrying warp in the weather is never far away. Late winter and early spring turn into a meteorological rollercoaster. A late March heatwave culminates in a raging moorland fire that had to be water-bombed from the air. Then winter returns “with swirling rage and dramatic destruction”. Temperatures fall to -8 in the glen in April. He can’t conclusively attribute it to climate change,, but “it was just the sort of extreme aberration we were being warned would characterise climate change”. One direct consequence was that the local rooks, unable to feed chicks that hatched the previous month, just gave up and went, abandoning 29 nests. It’s easy, and understandable, for us to simply close our minds to these depressing developments and to take simple pleasure in the enduring beauty of nature and landscape in many places in Britain. After all, what can we , individual do that would change anything? And John Lister-Kaye celebrates just as much as he laments in this fine book. Ultimately, though, its strength lies in the way he addresses a reality most of us don’t wish to talk about.